The book, Comfortably Numb-A History of “The Wall’ is lavishly illustrated, with over 400 pictures throughout the book. Chapter 2, page 34 begins the section about The Wall sessions at Super Bear Studios in France. 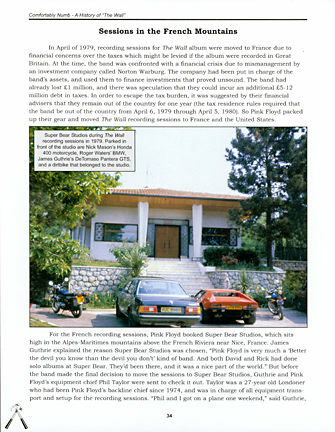 On this page is a photo of Super Bear Studios during The Wall recording sessions, with the band members vehicles parked out front. Chapter 4 contains detailed information about how the band prepared to stage The Wall live. 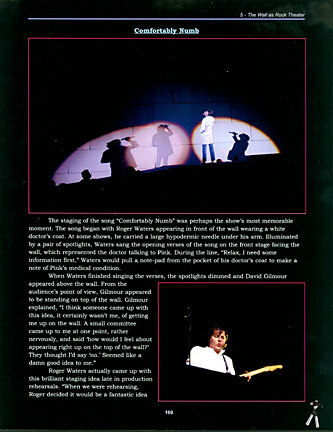 On page 126 are two production photos from the developmental period of The Wall stage shows. The top picture is a view of The Wall being tested at Culver City Studios in January of 1980. The bottom picture shows the Styrofoam maquette of the Teacher puppet, that was used to create the actual puppet. Chapter 5 is a song by song look at The Wall in concert. 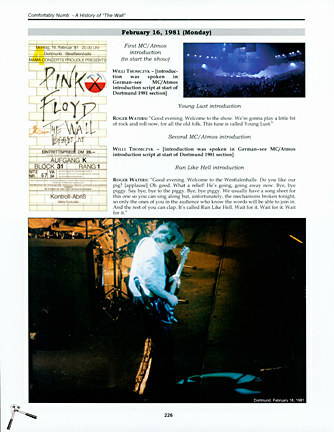 Page 169 examines the performance of the song, Comfortably Numb. The top photo shows Roger Waters on stage, singing in front of The Wall, while the bottom picture shows David Gilmour performing his guitar solo from above The Wall. 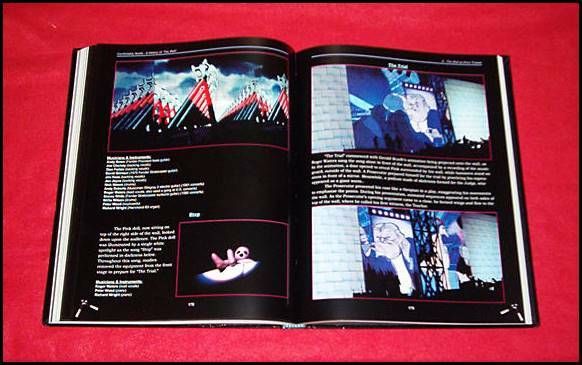 Chapter 6 provides information about each of the 31 Wall shows that were performed worldwide. 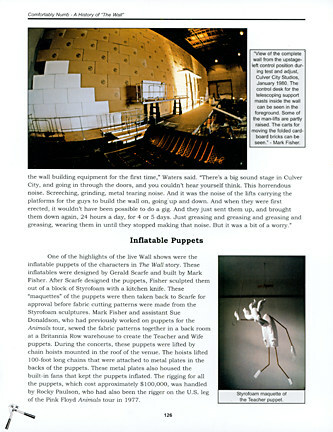 Page 226 is a look at The Wall live performance at the Westfalenhalle in Dortmund, West Germany on February 16, 1981. At the top is a picture of an actual ticket from the concert, as well as a photo of the crowd inside the Westfalenhalle. At the bottom is a picture of David Gilmour on stage at the Westfalenhalle on February 16, 1981. This book also contains a variety of pictures of Wall memorabilia. 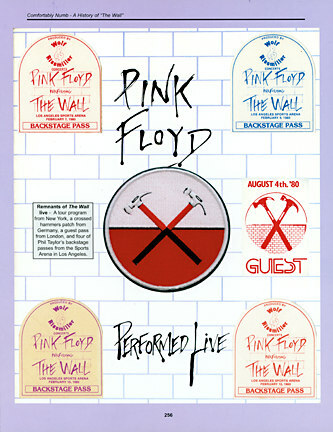 Page 256 shows remnants of the Wall live, including a tour program from New York, a crossed hammers patch from Germany, a guest pass from London, and four of Phil Taylor’s backstage passes from the Sports Arena in Los Angeles. One of the highlights of the book is the detailed listing of the equipment that was used to record The Wall album and stage The Wall live in concert, compiled by James Guthrie, Phil Taylor, and Vernon Fitch. 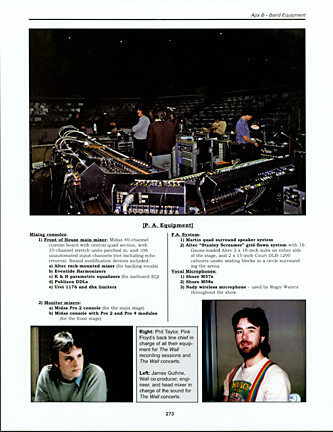 On page 273 are pictures of the mixing equipment being set up for The Wall concerts, plus pictures of Wall co-producer and engineer, James Guthrie, and Pink Floyd’s backline chief who was in charge of all their equipment for the Wall recording sessions and The Wall stage shows, Phil Taylor. This is only a sampling of the many unusual pictures you will find within the pages of this amazing book.